England Sevens are in Pool B, along with Argentina, Wales and Samoa. England are standing 7th in the table, we could do with a couple of good performances. Dan Bibby, Tom Bowen, Phil Burgess, Alex Davis, Richard de Carpentier, Mike Ellery (Saracens), Ruaridh McConnochie, Tom Mitchell Ollie Lindsay-Hague, Dan Norton, James Rodwell, Ethan Waddleton. 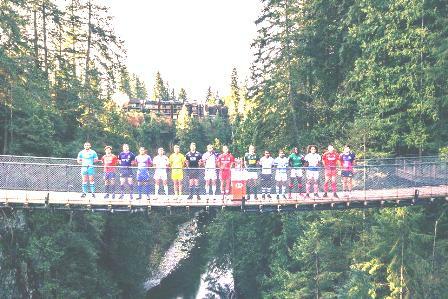 Sixteen captains of the HSBC World Rugby Sevens Series took to the Capilano Suspension Bridge today as Canada prepares for a blockbuster weekend of sevens rugby. I have stood on this bridge in Vancouver and if you don't like heights it is not for you. Yikes!! !